The Mojave Family Adventure is an AMA Sanctioned OFF ROAD event held in the scenic and historic Mojave Desert near Ridgecrest, California. This event is open to any motorcycle, quad or UTV. This event is FREE to children of ALL AGES. There is NO CHARGE for your child! Q. "What if I want to bring my 5 year old and they ride as a passenger in the UTV with mom?" Q. "What if I'm 60 years old and my kid is 40 and we both ride dirt bikes? Q. "What if I have 10 kids aged 2 years to 20 years old and we all ride together as a family on a combination of dirt bikes, quads & UTV's?" A. ALL CHILDREN ARE FREE! 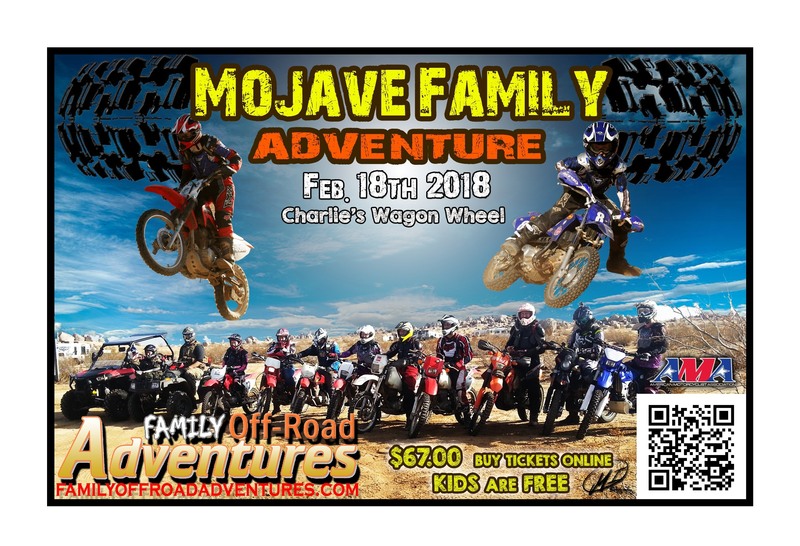 This is a family-friendly, one day, GPS based, self-guided adventure taking you from the Spangler Hills OHV riding area to the living ghost town of Randsburg, CA. Using existing trails you’ll travel approximately 40 miles to the lunch stop & back. There are plenty of opportunity to explore and sight-see on this day-long family adventure! This is beginner-friendly route suitable for all levels of riding skill! Experienced riders have MANY opportunities to explore and learn more about the area. Event is operated under permit from the Bureau of Land Management and limited to 150 riders so register early! 150 rider limit so register early! Directions: From Highway 395 take Searles Station Cutoff North to Trona Road. Turn North on Trona Road. Continue on Trona Road till you arrive at the Wagon Wheel OHV Staging Area and proceed to the designated meeting point. (Click Here for MAP). Amenities: Dry camping is available at the Wagon Wheel staging area. Hotels and other lodging available nearby in Ridgecrest, CA. The closest stores and restaurants are about 15 minutes away in Ridgecrest. Registration & Staging Location: Follow the signs to the registration booth to pick up your packet. Registration starts at 9am Sunday morning. Lunch: Lunch will be on your own in Randsburg, California. We recommend the Randsburg General Store! GPS Routing: Bring your GPS!!! A download of suggested routes and destination will be emailed to you a few days before the event. Scenic Rides: THIS IS NOT A RACE!!! This is a fun, EZ-to-follow, off-road, leisurely, scenic and historic trip through the beautiful Mojave Desert. In most cases routes are passable with a high clearance vehicle. There is also a paved route to Randsburg so non-riders to meet you for lunch. If routes or destinations are closed alternates will be selected. Motorcycle Requirements: All motorcycles must meet the following requirements. Failure to meet ALL requirements will result in your money being refunded and you being asked to leave the event. Quiet muffler with a spark arrester is mandatory and only helps our sport. Nothing above 94db! Must be registered and legal to operate in a designated OHV area. You will need to be able to go at least 30 miles on a tank of gas. Bikes and riders that can travel at sustained speeds of at least 30MPH on a dirt road are suitable for this event. Destination and routes are only our recommendations. The area has SO MUCH to offer that we hesitate to limit your experience. GPS downloads are an accurate representation of the route and include way points and various locations of historical significance and scenic beauty. A reference map showing suggested destinations and routes is included. Bring a camera! This is a beautiful area! All Day - Have fun! Mitch, you probably just need to install something that will allow you to open a .pdf document. Adobe Reader is a free option. Let me know if that helps. We kept registration closed until after January 1st. Registration is now open!